season while earning at least one point. The Hawks (14-0-3) have now played 17 games this year without a regulation loss. I will have more on this sometime tomorrow. Well, apparently Brendan Shanahan saw things differently and as a result handed Hansen a 1-game suspension for his elbow to Marian Hossa’s head. Shanahan pointed out that once Hansen realized Hossa had the inside position on the play, Hansen clenched his fist and “carelessly” extended his forearm to the back of Hossa’s head with no intention of playing the puck. The fact the Hossa was injured and did not return to the game, along with Hansen’s clean history in the league, led to the 1-game ban. Had Hansen been previously penalized by the league, he may have been looking at a 2-3 game suspension. I said it earlier this week in my blog that it wouldn’t take much of a spark to re-ignite the rivalry and hatred between the Hawks and Canucks. After what happened in Tuesday night’s game, it is safe to say that the rivalry and hatred between the two sides is back in full swing. The Blackhawks’ win on Tuesday night over their rival Vancouver Canucks marked their 16th straight game to start the season with at least one point. That ties the all time NHL record set by the Anaheim Ducks in the ’06-’07 season. While most people would assume that the Blackhawks would be celebrating this accomplishment, the general attitude of the Hawks and their fans following last night’s game was pretty subdued. This was due to the fact that not only did the Hawks blow a 2-goal lead in the last 4 minutes of regulation, but Marian Hossa had to be helped off the ice after a blow to the back of his head. The game started off with a very fast pace. Within the first 10 minutes of play, a total of 5 breakaways had already taken place; 3 for the Hawks and 2 for the Canucks. Incredibly, no goals were scored. Then with just over 13 minutes gone in the first, Daniel Sedin lit the lamp with a soft backhander that somehow found its way through Ray Emery’s legs, giving Vancouver a 1-0 lead. The score would stay that way heading into the second period. Again, the second period started off with a fast pace just like the first, but with no breakaways for either side. After generating a few good scoring chances, the Hawks finally beat Corey Schneider to tie the game. Patrick Sharp scored his 4th goal of the season after a nice feed by Kane left Sharp open to Schneider’s right for a wide open slap shot. The puck found its way right through the five-hole and into the back of the net. About 7 minutes later and on the powerplay, Marian Hossa scored on another slapshot from the opposite side of the zone to give the Hawks a 2-1 lead. Then, only about 4 minutes after Hossa scored, he scored again for his second of the game. In typical Marian Hossa fashion, he won the puck battle along the boards in the corner to Schneider’s right, fought his way to the front of the net, and somehow was able to sneak the puck into the net between Schenider and the post. He literally had maybe only 3-4 inches between Schneider and the post, but he was able to get the goal. This increased the Hawks’ lead to 3-1. It would stay that score until late in the third. With a little under 3 minutes remaining in regulation and the Canucks on the powerplay, Alex Edler beat Ray Emery with a slap shot from just inside the blue line to bring Vancouver within 1 goal. Then, a little over a minute and a half later and with Canucks’ net empty, Kevin Bieksa’s slap shot beat Emery again to tie the game and send it to overtime. No one was able to score in OT, even though the Hawks outshot the Canucks 5-1. In the shootout, Patrick Kane and Andrew Shaw (yes, Andrew Shaw) both scored for the Hawks, and only Chris Higgins scored for the Canucks giving the Blackhawks the W.
However, aside from the Blackhawks record-tying start to the season, the biggest story from last night’s victory was Jannik Hansen’s hit on Marian Hossa. With only 1:10 gone in the third period, the puck was deflected high into the air around center ice, and both Marian Hossa and Jannik Hansen went to try and “grab” it. Hossa, with his head looking up at the puck and his hand ready to catch it, was elbowed in the back of the head by Hansen and fell face first to the ice. He would remain on his stomach for a good 2-3 minutes before getting helped to the dressing room. He would not return. After seeing the replay, it is clear that Hansen was not going for the puck and that he intentionally hit Hossa in the back of the head (he has a hearing with the NHL at 2:30 CT today). Whether or not he actually tried to injure him, we’ll never know. But it is clear that Hansen was not going for the puck. I happened to be at the game last night, and when the replay of this was shown on the scoreboard, there was not a fan in that stadium who didn’t want to personally “greet” Hansen after the game. Following the game, Joel Quenneville stated that Hossa seemed “okay,” and that they’ll know more today on his condition. Coach Q also declined to comment in any detail about Hansen’s elbow to Hossa’s head. Over the past 4 years, I along with every Hawks fan, has grown to hate the Canucks for their non-stop, cheap-hitting, dirty play. Whether it is Burrows pulling Keith’s hair, Daniel Sedin elbowing Duncan Keith in the head, Torres launching himself at Seabrook’s head, or now Hansen elbowing Hossa in the head, it is always something else with those low-lifes. Their head coach might be the biggest reason for it, too. Alain Vigneault doesn’t seem to think that anything his players do warrants a penalty or any discipline. Whether it was Torres’ hit on Seabrook, Sedin’s elbow to Keith, or Hansen’s elbow to Hossa, every time he says that his players did nothing wrong. There is a theory in the sports world that states “a team plays the way they are coached.” That might not be anymore evident than in the case of the Canucks. It is extremely hard for me to not let my emotions fly on here when talking about the Canucks. I absolutely despise everything about that team and their coach, and I feel that I am being polite when saying that. Even their fans are some of the worst in sports. Remember when the Bruins won the Cup 2 years ago, in Game 7, in Vanvouver, and the Canucks’ fans lit the city on fire? Remember when Zdeno Chara was handed the Stanley Cup by Gary Bettman and Canucks’ fans proceeded to throw cups of beer in Chara’s direction? After Hansen’s hit on Hossa last night, the Vancouver fans used Twitter to express their pleasure with the hit, calling Hossa a “wimp,” an “actor,” and saying that they were “glad” Hossa got hurt on the play. It’s a good thing those people live 2,000 miles away from Chicago and in a different country, because I don’t think I could handle it if they lived any closer, and I would be embarrassed to call myself an American along with them. I could go on for hours about the Canucks and their fans, but I won’t. All in all, the Blackhawks again blew a late lead and ended up in overtime. They have got to step up their late-game play and win these games in regulation. At the same time, I won’t complain about their historic start. With Sunday’s 3-2 win over the defending Stanley Cup champion L.A. Kings, the Blackhawks made it 15 straight games to start the season without a regulation loss. The 2006-2007 Anaheim Ducks set the all-time record for consecutive games to start a season without a regulation loss at 16 games. If the Blackhawks can avoid losing to the Canucks in regulation tomorrow night, they will tie that record. The only 2 teams in NHL history to make it at least 15 games without a regulation loss (1984-1985 Oilers and the Ducks) both won the Stanley Cup. While that is an interesting statistic and one that bodes well for the Hawks, it really means nothing. There is a lot of season left and then the playoffs, so a lot can still happen. Right now, the Blackhawks are 3 games into their 7-game homestand and are 2-0-1 in those 3 games. In their first home game of this 7-game stretch, last Tuesday against the Ducks, the Hawks lost 3-2 in a shootout. They had a 2-1 lead heading into the third, but then allowed the Ducks to score with only a few minutes left in regulation, which sent the game to OT. 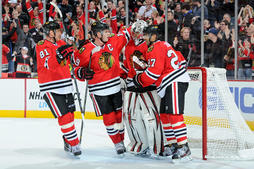 Friday night against San Jose, the Blackhawks dominated from start to finish and won 4-1. Even though the Sharks were, and still are in the midst of a free fall, that was a good win for the Hawks against a Sharks team that started the season 7-0. Jonathan Toews really helped to set the tone in that game by fighting a much bigger and much tougher Joe Thornton. Yesterday, the Hawks continued their winning ways by defeating the Kings 3-2. The Blackhawks looked great through the first 40 minutes of the game, but then let their guard down in the third period and allowed L.A. 2 powerplay goals. If there has been a weakness of the Blackhawks this season, it has been their recent trend of letting teams back into the game in the third period. Last Tuesday against the Ducks, the Blackhawks really controlled much of the first 2 periods. Then came the third period, and the Hawks seemed to resort to strictly playing defense and clearing the puck out of their own zone. It looked as though they had no interest in burying the Ducks with a huge third goal, and instead were intent on defending their own net for the last 20 minutes. As a result, the Ducks tied the game and won in a shootout. Yesterday was the same story. After absolutely dominating the defending champs through the first 2 periods and leading by a score of 3-0, the Hawks backed off again in the third, took a couple bad penalties, and before you knew it were only up by 1 goal. If it wasn’t for the clock running out at the end of the game, I am sure that L.A. would have tied it had they had another 2 minutes to play. The Hawks were lucky to get out of there with a win, and only because the Kings ran out of time at the end of the game. Moving forward, the Blackhawks are going to need to develop and consistently display that “killer” instinct of putting away their opponents when they have a late lead. They cannot continue to let other teams gain momentum in the third period and steal games from them that the Hawks should have won. Having said all of that, the Blackhawks are still 12-0-3 and lead the NHL with 27 points. They have beaten many good teams already this year and are showing no signs of slowing down. Their powerplay has picked up a couple of goals now over the last few games, which is encouraging, but their penalty kill gave up 2 third period goals yesterday to the Kings. I guess you can’t always be perfect. Tomorrow night will be another big game for the Hawks as they welcome Vancouver to town for the first time this season. The Canucks have played pretty well lately and just got Ryan Kesler back from injury. On top of that, their whole goalie “controversy” seems to have evaporated as both Luongo and Schneider are playing very good as of late. Although the last meeting between these two teams wasn’t as physical as most fans would have expected, all it takes is one little spark to set off the always-present hatred between the two sides. Interesting stat: Since acquiring Johnny Oduya at last year’s trade deadline, the Blackhawks’ record is 24-2-7 with him in the lineup. We are exactly a quarter of the way through the Blackhawks’ season already, and they still haven’t lost a game in regulation. The Blackhawks, 10-0-2, lead the NHL in wins, road wins, and points (22). Most people expected a few losses on this recent 6-game road trip (myself included), but the Hawks earned at least a point in each game. The road trip started off with the Hawks losing in a shootout to the Wild, followed by another shootout loss to the Canucks. It seemed as though the offense of the Hawks was beginning to come back to reality after a torrid start to the season. Their next game in Calgary can only be considered a miraculous win. Ray Emery played one of the single greatest games that any NHL goalie has played over the last 5 years or so by stopping 45 of the 47 shots that he faced; many of which were high quality chances. After allowing the go-ahead goal to the Flames with about 35 seconds left in the third period, the Hawks pulled Emery for the extra attacker. Following a perfect cross-ice pass by Kane to Oduya, the puck eventually found its way to the stick of Marian Hossa, who shot it in past a distraught Mikka Kiprusoff with 4 seconds left to tie the game. The Blackhawks would go on to win the game in a shootout. This was the turning point of their road trip, as the Hawks went 3-0 in their final 3 games of the trip. Following their victory over Calgary, the Blackhawks went into San Jose to take on a then “hot” Sharks team. The Sharks made it 2-0 early in the first period, but the Hawks battled back and ended up getting a 5-3 victory. This win made it very clear who the best team in the West was. From San Jose, it was on to Phoenix. This game was over after the first period. The Blackhawks scored twice on 5 on 3 powerplays, and ended the first leading 4-0. Many of the players credited Jamal Mayer’s early fight with Raffi Torres for their boost in energy and play. The Hawks would end up winning this one 6-2, and Joel Quenneville has called this their best game of the season so far. Last night, the long road trip finally came to an end in Nashville. The Blackhawks again dominated this game from start to finish, often making it seem like they were playing with a man-advantage when they really weren’t. The final score ended up being 3-0, giving Corey Crawford and the Blackhawks their first shutout since April of 2011. Every other team in the NHL had at least 2 shutouts last year. So now the Hawks come home for a 7-game home-stand, which isn’t exactly favorable for the home team. Playing at home for 7 straight games doesn’t allow the players to be around each other and bond as much as they do on the road. One can only hope that they don’t fall out of sync and turn this long home-stretch (every game against a good team, by the way) into a losing streak. Some people, myself included, are almost scared by the Hawks’ fast start. We all know that there is no way that they can keep up this type of play for the whole season, but is this just an incredibly hot start, or is this a sign of things to come from here on out? While I am staying very cautious and not jumping the gun on this team, I do believe that the Hawks are as good as they have been playing thus far. This team is absolutely loaded with offensive skill, their defense is playing fantastic, and the goaltending has been just what the doctor ordered. People forget that Keith, Seabrook, and Hjalmarsson all had “off” years the past 2 seasons. This year each of those guys, along with Oduya and Leddy, are playing great and up to their potential (Leddy can still be better). Offensively, the line of Hossa, Toews, and Saad has been nearly unstoppable. Brandon Saad has been a very nice addition to the team this year and seems to be getting better each game. And how about Patrick Kane? He is playing out of his mind right now and was just named the number 1 star of the NHL for this past week. He has at least one goal in 5 straight games and is second in the NHL in points with 19. If he keeps this up, he will without a doubt be a Hart Trophy candidate at the end of the season. Looking forward, this 7-game home-stand is going to be a major test for the Hawks, and it all starts tomorrow night against the streaking Ducks. After the Ducks, the Hawks will play the Sharks, Kings, Canucks, Sharks, Blue Jackets, and Oilers. All of those games, with the exception of the Columbus game, are going to be tough tests for the Hawks on their home ice. Normally a long stretch of home games bodes well for most teams, but this one for the Hawks could be a bit of a trap given the fact that they are going to play some top teams and haven’t lost yet in regulation. While we all thought we would know a lot more about this team after their 6-game road trip (and we do), I think that we will know even more following this long home-stand.